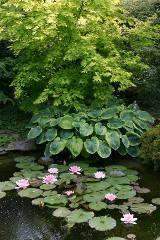 I'm a producer of waterlilies, aquatic plants, daylilies and rare perennials here in the south part of Belgium. 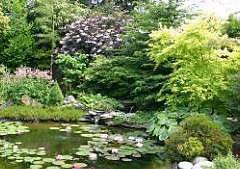 My garden is about 2500 square metres (.6 acre), with five pools and a collection of 75 hardy waterlilies. Six of them are of my own hybrids. Visitors can enjoy my little paradise during the summer in June and July. In addition to aquatic plants, I present about 80 recent Hostas, 800 daylilies (all from the USA, 450 of them dated 2000 to 2006) and about 2000 seedlings from my hybridization the three last years. I love trees and shrubs, too. More than 20 apple trees, 15 magnolias and about 120 other rare ones grow in my garden. My nursery, next door to the garden, is 800 square metres (.2 acre). Nymphaea 'Pol's Pink Glory' I was born in 1946 in Charleroi, a town near the French border. In 1967, I began to sell tropical fishes for aquariums. I made fish tanks for lobsters and crayfishes. I imported fresh water fishes from Singapore and marine ones from the Philippines and Sri-Lanka. 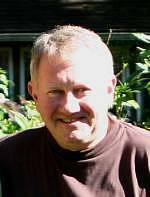 Ten years later, I opened my nursery for aquatic plants and I began to create water gardens with the pools man-made in polyester in place. I fell in love with waterlilies. I brought them in from England, France and Germany and started their production. I stopped my activities in the aquariums fishes shop in 1992. Since then my wife Danielle and I work only in our nursery in Tarcienne. We have increased the production of perennials. I visit daylilies hybridizers in Florida and the east coast of the USA each spring to buy new introductions of those marvelous plants! I shall now add water gardens to my trips! Given the Belgian climate, we can only keep hardy waterlilies in outdoor cultivation. 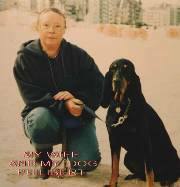 We are animal lovers. 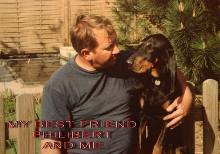 Philibert, who died two years ago, was a Champion Bruno du Jura. Rosalie is a French Bouledogue. My book "Les Nymphéas Rustiques" was published in 2005 by Belgique Editions "Jardins et décors aquatiques". I have written many articles for reviews, associations and clubs regarding daylilies, waterlilies and other plants. I also enjoy photographing plants, which you will see when you visit my web site.